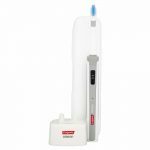 The Colgate C200 Proclinical is a sonic toothbrush that effectively removes plaque and cares for the gums, using the sonic wave cleaning technology. The C200 has proved to remove plaque up to 5x more effective than manual brushes and polishes the teeth for achieving that white smile. The brush is shaped in such a way that it provides great interdental cleaning. Consumer ratings of this electric toothbrush are excellent. The C200 Proclinical conveniently is shipped with a charger and traveling case. Its design is not highly futuristic but does have the looks of a high-end toothbrush. It is quite slim and lightweight, which makes it easy to maneuver. 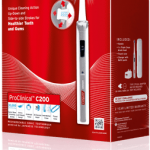 The Colgate C200 Proclinical is a good electric toothbrush, with good technology. However, compared to the other electric toothbrushed on the market, it misses the pressure sensitivity technology and is quite pricey. You might be interested in looking at the Oral-B Professional Care Smart Series 5000, on which we did a full review here.